For our first weekend with the Whites, we treated them to a Sunday afternoon, Victorian style. 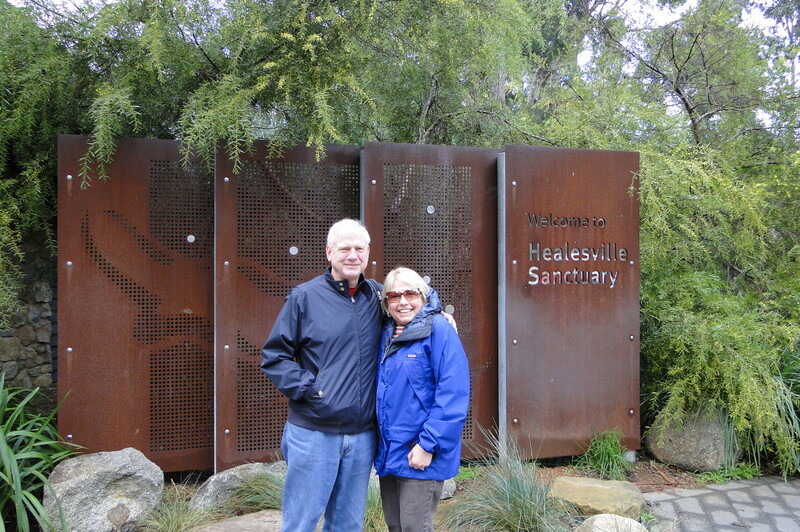 That is, a wine tour of the Yarra Valley and some seriously adorable Aussie animals at the Healesville Sanctuary. Despite the gray and rainy weather, we took off for the coast this weekend and spent the day on Mornington Peninsula. Kelly & Adam had suggested lunch at Montalto Vineyard, which has received an Aussie “chef’s hat” (the equivalent of a Michelin star) for its restaurant concoctions and has an award-winning Pinot Noir available at its cellar door. So on Saturday we rented a car and headed down south of the city. First, we dropped in on the T’Gallant winery to stock up on a few of our favorite wines for the impending visit from the (in-law) Whites, then we spent the afternoon tasting, noshing, and traipsing around the muddy Montalto grounds. Check out the full pictures here. The last chapter in a series of posts about our adventures with Leah and Jordan. As you may recall, in an adventure filled week we (1) drove to Phillip Island, down Mornington Peninsula and out to the Great Ocean Road, (2) flew in and out of Sydney, and (3) sampled amazingly tasty and upscale cocktails at the famous Der Raum. And after our night of cocktailing, it was time to sample some of Australia’s amazing wines in the famous Yarra Valley wine country. After all, on a sunny Melbourne Saturday, what could be better than an all-day tasting feast? We sampled reds and whites from 5 different wineries, including the Chandon Estate, and learned heaps about tasting and making wine. Check out the full story of our Yarra Valley wine adventures on the out and about page. As the end of the year approaches, Greg, having just discovered he receives a yearly allotment of S&C funds for junior associate “development”, generously offered to take us out for an amazing afternoon lunch at a vineyard, the Vines. So, on Sunday morning Greg, Adrianna, Krisztian, Steve and I set out for the south east coast, an hour and a half south of the CBD in Melbourne, to the Mornington Peninsula. The main event was a bit disappointing. Vines of Red Hill boasts all farm fresh organic food raised on French Island (a virtual nature preserve just off the coast) selected seasonally and daily to create a perfect dining experience. Although my food was great (for entree, a spin on eggs benedict (duck egg, prosciutto and brioche) with Kurasodoi beef topped with pate for a main, accompanied by a robust, complex pinot noir, and tart cherry soup and fig gratin for dessert, with cappuccino (served with a coconut merengue)), not everyone was so lucky. Steve and Greg had large chunks of fat with a few strings of beef in there somewhere for mains, and though almost everyone got the eggs benedict for an entree, not everyone was a fan of the spicy Hollandaise spiked with curry. Service was slow, and apologies were not forthcoming for the lousy meat. Sorry Vines, I thoroughly wanted to write a raving review to post on “eats”, but no can do. But, our backup plan to see a bit more of the peninsula before heading back to the city was a spectacular success. Unfilfilled by our meal, we headed to Cape Schanck, the southern-most tip of the peninsula. Extremely windy, with extremely beautiful sweeping vistas of the coast and cliff-crashing waves, I was quite pleased with how the afternoon turned out. More pictures on the out and about page.